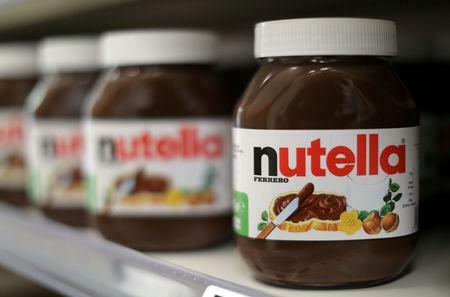 MILAN (Reuters) - Italian confectioner Ferrero has temporarily halted activity at the biggest production plant of its Nutella spread because of a quality issue that emerged late Tuesday afternoon, it said. Located in France's Normandy region, the facility produces a third of all the Nutella jars sold globally, according to the company's website. On Tuesday "after reading the results of one of the quality checks at our Villers-Ecalles factory, we noticed a quality defect in one of the semi-finished products used in the manufacturing of our products Nutella and Kinder Bueno," Ferrero said in a statement. It added the temporary suspension was a precautionary measure to allow the confectioner to carry out further investigations. "For now, we can say that none of our products currently on the market are affected by the situation and that supply to our customers continues uninterrupted," Ferrero said. The group said it would take countermeasures once the outcome of the investigation became known at the end of the week. Chocolate-and-hazelnut spread Nutella is very popular in France, with heavy discounts on the product last January leading to brawls breaking out among shoppers in a chain of supermarkets. Ferrero, which also makes Ferrero Rocher pralines and Kinder chocolate eggs, on Wednesday reported sales of 10.7 billion euros (£9.3 billion) for the year to August 30.